In stock -This product will ship today if ordered within the next 10 hours and 25 minutes. 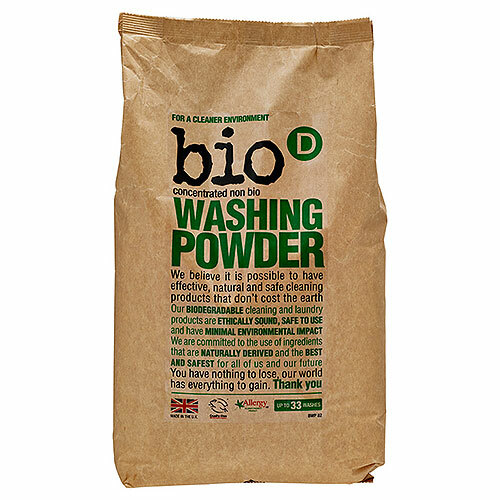 This fragrance free, non-biological Washing Powder is accredited by Allergy UK; its hypoallergenic, concentrated formula is highly effective while gentle on even the most sensitive skin. Can be used in automatics, twin-tubs and for washing by hand. 15-30%: Zeolite, Soda Ash. 5-15%: Sodium Metasilicate, Sodium Percarbonate. Below 5%: Anionic Surfactant, Vegetable Soap, Cellulose Colloids. Suitable for water temperatures 30° - 90°C. Always follow instructions on garment label. Hand Wash: Ensure the powder is fully dissolved before immersing clothes. Always rinse garments thoroughly in clean water before drying. Hand Care: After each hand wash, rinse your hands thoroughly in clean water and dry. People with damaged skin should pay particular attention to this instruction and avoid prolonged contact with the washing solution or wear protective gloves. Fabric Care: Always test for fastness and wash non-fast coloureds and whites separately. 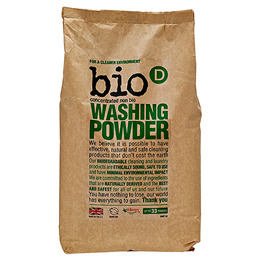 Below are reviews of Bio D Washing Powder - 2kg by bodykind customers. If you have tried this product we'd love to hear what you think so please leave a review. Washes well and you don't need to use much at all. Washes really well! Very competitive price.